Arsenal striker Pierre-Emerick Aubameyang hasn’t started any match ever since he came back from international duty and many people believed that this was a tactical decision by Unai Emery because he wanted to abandon the use of two strikers at the same time. 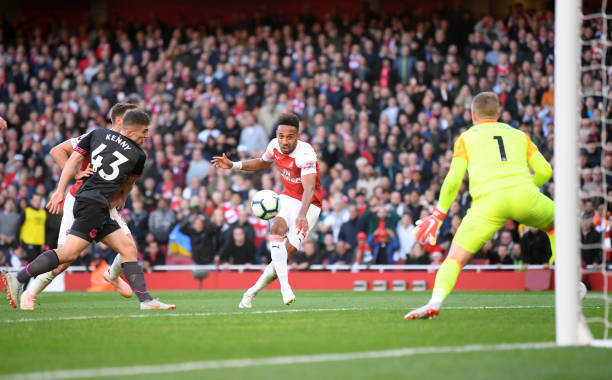 Pierre-Emerick Aubameyang was on the bench on Monday when the gunners beat Newcastle United 2-0 and the Arsenal fans expected to see him in the starting eleven that faced Everton since he had assisted Alexandre Lacazette’s goal in the previous match despite having come into that game as a substitute. Arsenal head coach Unai Emery has finally made a clarification about this subject to put to bed the criticism that he has got for not including Pierre-Emerick Aubameyang in the starting eleven that faced Newcastle United and Everton. The Arsenal boss has said that he made this decision because Aubameyang had a problem which saw him start taking antibiotics. “The first reason [he was benched] is because he had a small problem and he has taken antibiotics for his illness. That’s the main reason he didn’t start those two matches. For tomorrow, he’s getting better and can start or can play after.” Unai Emery told Arsenal Media. The Arsenal fans will be happy that Unai Emery has hint at adding Aubameyang in tomorrow’s starting eleven because he has said that the Gabon international is now feeling better. The gunners have been impressive when both Aubameyang and Lacazette are in the starting eleven so it will be interesting to see if they will score against Napoli in this upcoming UEFA Europa League tie.